To find intersection of curve and a straight line we first need to know the mathematical condition behind it. I consider two equations : y1=2x+5 and y2=x^2+1 . On the basis of these equations i created data for three variables that are x, y1 and y2. 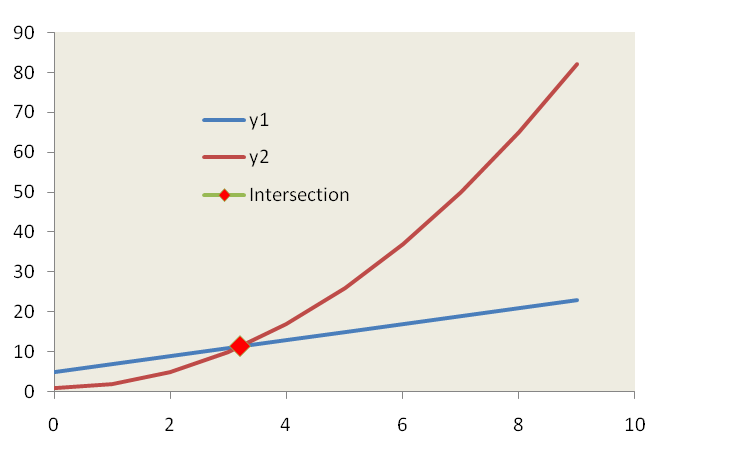 Compare the values of Y for the two lines in every successive row. Where m1: Gradient or Slope of line1, c1: Intercept of line1, m2: Gradient or Slope of line2, c2: Intercept of line2. 5 Responses to "Excel : Intersection between curve and straight line"
What if I don't know the equation of the curve and the graph is generated through given data points?